Patti Substelny is the current Board President for Maximum Accessible Housing of Ohio (MAHO), where she has been a Board member since 2011. Patti has multiple sclerosis and uses a power chair to get around most of the time. But she hasn’t let her disability stop her: as she constantly reminds herself, “I have a disease, but I’m not sick.” Patti has led an active life even after retiring in 2007 and has not found retirement to be very relaxing. As a woman, she knows she’s faced some adversity, but Patti has still had a positive impact on everyone she’s come in contact with. Patti was born in Cleveland, Ohio, and is the youngest of three children. Her family believed in education, so when she graduated from Padua Franciscan High School in Parma, the question wasn’t whether or not she wanted to go to college, it was which college she would go to. Her family had a strong focus toward Jesuit education, so Patti attended John Carroll University, like many of her family members did. She graduated from John Carroll University with a Bachelor’s Degree in Economics and also had the chance to study International Currency and Labor Economics at University of Cambridge in England during her undergraduate career. After graduating from John Carroll, Patti attended Michigan State University, where she earned a Master’s Degree in Labor Economics and Human Resources. After receiving her degree, Patti worked for over ten years in the industry in Detroit, Toledo, and Cleveland. Patti was in the middle of her career and about to marry Mike Substelny when she was diagnosed with MS in 1997, just a month before her wedding. Patti decided to give him an out, she explained; he hadn’t signed up for her to have multiple sclerosis. Mike responded, “of course I’m going to marry you!” They’ll be married for 20 years next November. Right before her diagnosis, Mike and Patti had purchased an older, two-story home in Cleveland Heights. The both loved the house, so they chose to renovate it to fit Patti’s changing needs. In 2010, their home was renovated to include an accessible kitchen, eating area, back porch, and indoor and outdoor ramps. Patti also has a stair lift to transfer to the second floor of the home. In 2015, Patti’s home and story were featured in The Plain Dealer. In 2007, Patti retired from working full time due to her disability, but she hasn’t really been “retired” in the traditional sense. In fact, she has more jobs now than when she was working! But, the nice thing about retirement, Patti explains, is that she can pick and choose the activities she wants to be involved in. Patti currently serves as the President of the Board for MAHO and is on multiple boards at the Cleveland Clinic, including the Editorial Review Board for the Journal of Patient Experience. Patti is also very involved in her community; she has worked with the Home Repair Resource Center in Cleveland Heights and consults with the start-up We Can Code It in Cleveland. Patti was also a professor for a number of years and taught macro and microeconomics at the collegiate level. Patti also entertains weekly, if not more, and uses her accessible kitchen and home to cook for and host 50 or 60 guests. Since being diagnosed with MS, Patti’s life has changed significantly. She’s become an advocate for people with disabilities at both MAHO and the MS Society. 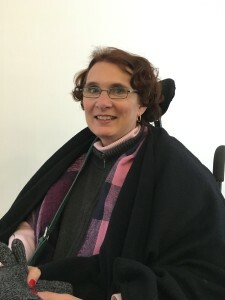 In her five years at MAHO, Patti has led by example to advance MAHO’s mission to provide and promote accessible housing solutions for people with physical mobility disabilities. Her energy and enthusiasm for the cause are infectious and inspiring to the Board and staff. 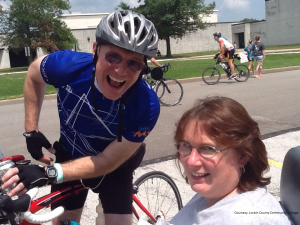 At the MS Society, Patti and her husband have raised over $500,000 for MS research as part of the Patti’s Paladins bicycling team for Bike MS. Beyond the MS Society and her work at MAHO, Patti is a constant advocate for accessibility and disability awareness. “My friends look at the world differently,” she explains. When Patti’s friends want to get together for dinner, they have to make sure the restaurant can accommodate her power chair. She’s made the people who love her think a little bit. Patti has overcome her fear of MRI’s (or Magnetic Resonance Imaging). An MRI is an extended medical scan where your body is inserted into a noisy small tube space for a long period of time. Patti also has to have her legs strapped down to make sure they don’t move during the scan. Increases in technology have made the machine quieter and the process shorter and, combined with mental practice, Patti has overcome her fear, although we’re not sure she’ll be elated the next time she needs one. Last, but not least, one of Patti’s greatest accomplishments is being able to keep two thoughts in her brain at the same time: “I have a disease, but I’m not sick,” she explains. While she might have MS, Patti is more than capable of doing all the amazing things she’s done. Patti has had to overcome a lot of obstacles, not the least of which is being a woman with a disability. As a woman, she has definitely felt that she has had to prove herself more than men do. She also believes many people think she has a deficit, especially because of her disability. “I lose 75 IQ points because of the power chair,” she says, discussing how some people view people with disabilities. She also found some adversity as a woman majoring in economics. She once told a male peer she was majoring in economics, and, according to Patti, he automatically assumed she meant home economics and asked if she liked cooking or sewing better. Being a woman with a disability hasn’t stopped Patti from having a strong impact on her community and everyone she meets. “I’ve had to push things,” she said. And she’s been successful, working in her industry, volunteering and fundraising to create a better world for people with MS and other disabilities, and cultivating long-lasting relationships with those she loves most. Patti’s a go-getter, and we’re not about to stop her!